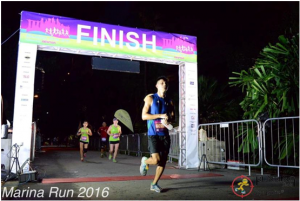 Race Review: Marina Run 2016 [Half Marathon] (by: Run Your Pace) | JustRunLah! Marina run marks the first HM that I will be running alone as I aim for a sub 2, hoping to check this off my New Year fitness resolution. I had put in my efforts in the past months, consistently clocking in my mileage even as school gets busy, so I was feeling rather hopeful and confident. 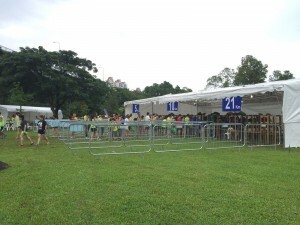 I utilised the shuttle bus service from Mountbatten MRT station to the race site and to be honest, I was really impressed with the shuttle bus frequency (every 2-3 minutes). The queue was really long when I joined in, but it took merely 15-20minutes before I managed to hop on a bus. It was a short ride to the race site and upon reaching, I did my final preparations. 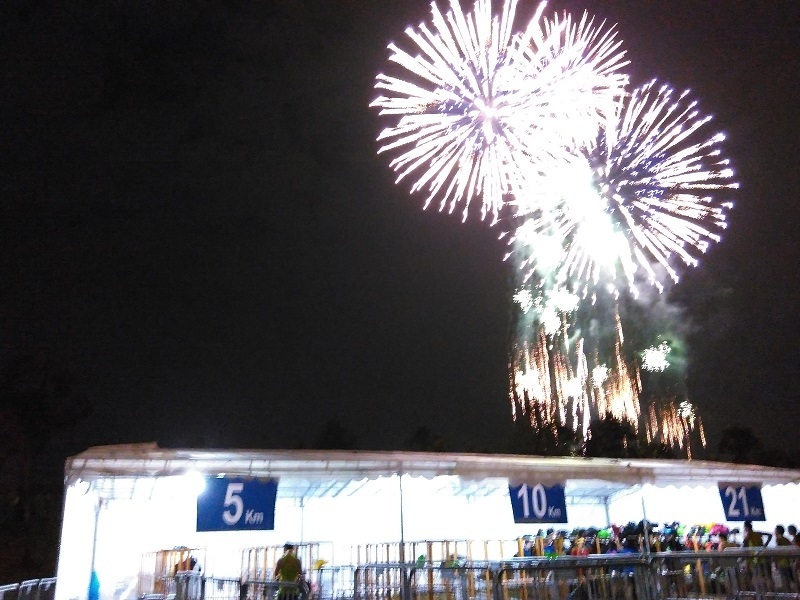 Looking across the race site, one could spot two long rows of portaloos with no queues at all. The baggage deposit seemed to be well organized this time round. It was separated by race categories and the queues were moving fairly fast. It certainly seemed to be a much improved organization than the comments that we had heard from previous years. Baggage deposit was fairly organised, with sections for different categories. I went ahead to queue up at the starting pen and soon after, I was flagged off in the first wave promptly at 7pm. I was feeling a little nervous yet excited, but I decided to take it easy right from the start and hoping to push a little harder in the second half. The weather was so cooling after a day of heavy raining; my body was feeling really good; and it seemed like all the stars were aligned for me to achieve my goal. In fact, up to the 10 km mark, I was pretty much still on track. The route however, was not the most ideal. 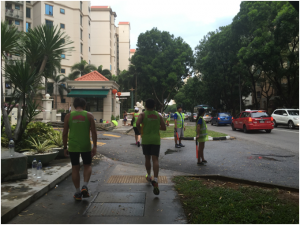 Within the first 10km, we were made to run along the pavements outside of condominiums where the pavement was narrow and other road users were taking their evening strolls/jog. What made things worse was that at one point, there was even a small open drain that we had to JUMP across. That was an accident begging to happen. Things took a turn for the worse in the second half of the run as the sun began to set and the route got really dark. And I mean, really really dark. I could barely see what was ahead of me at many points along the route. This was especially so in the 14th km, where the whole stretch of route was almost pitched dark. That stretch would make the perfect obstacle race if zombies were to suddenly appear and grab your feet. Thankfully, the runner in front of me flashed his phone’s torch light and I happily followed behind. Even so, vision was still terrible with the badly lit route and I had to take the extra effort to take care of my footing while slowing down for my own safety purposes. 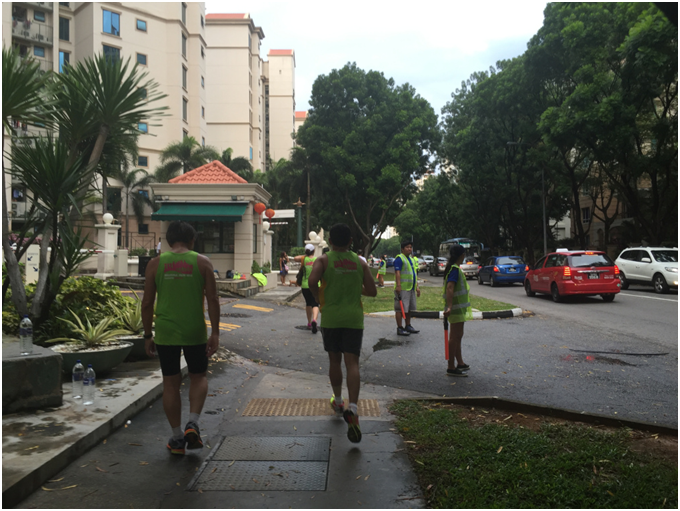 Time checked at 15km, 1hour 30minutes flat. Off target, but keeping my morale high as there was still a good 6km to go. Fatigue began to set in slowly and I was finding it hard to step up a gear for the last stretch. Hopes of a sub 2 were pretty much gone when I hit the 19th km mark, where the route required the runners to make a fairly high step up over a curb. That seemingly harmless curb killed my calves as cramps strike me out of nowhere. For the next few hundred metres, I was just hopping and dragging myself forward, at the same time shaking the cramps off. Alas, the finishing point was in sight and I managed to finish in 2hours 7minutes. That was 7minutes off my target, but I was still contented nevertheless. Moving into the finisher’s tent, the volunteers handed me my medal and finisher tee and I absolutely loved the designs! It’s probably one of my favourite thus far. I was also handed an apple and a banana and that was a welcomed sight as I was dead hungry from the run. 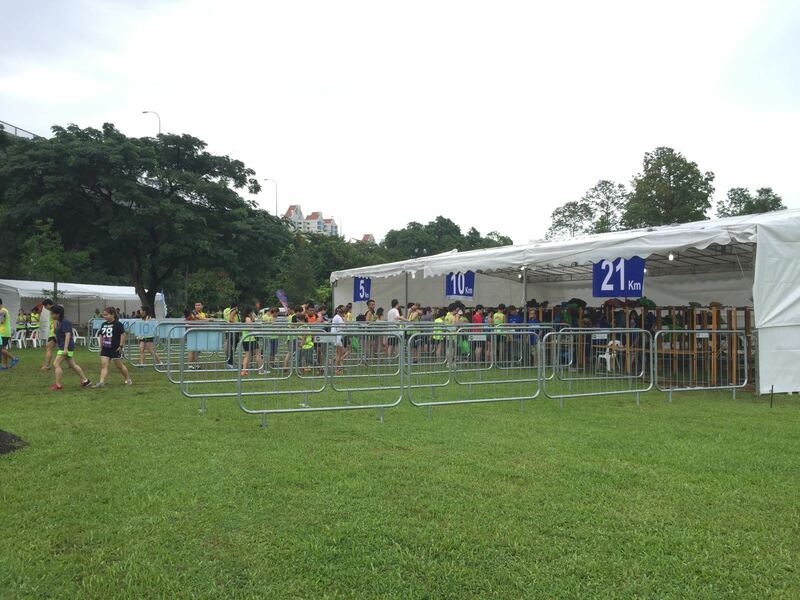 What a pity that there weren’t any bottled drinks for us thirsty half marathon zombies. Well, at least I ended at the perfect timing to view the beautiful fireworks while enjoying my fruits. Overall, as a first year participant in the marina run series, judging by this race alone, I would say that it wasn’t too bad but there are much rooms for improvement. Well, there may be several impressive parts that I liked, such as the shuttle bus services, the portaloos, the finisher entitlements etc, but there are still key areas that I feel were lacking in. My biggest qualm on race day would be that the route was badly planned with dangerous obstacles and bad lighting. Probably I’m e one who flashed the mobile phone flashlight that running just in front of u..